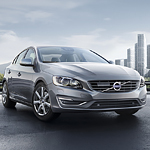 Get ready to be impressed by the Volvo S60 at Volvo of Dayton. We’ll walk you through all of the technology, including an amazing sound system. It’s easy to see why this luxury sedan is so popular. You can stay connected with contacts, stream music, and get directions with voice commands thanks to hands-free technology. Use either Apple CarPlay or Android Auto to connect your smartphone so that the system can utilize more of your apps. You can also enjoy a 9-inch center display with a touchscreen as well as a driver’s head-up display. The audio is incredible, allowing you to choose a premium Harman Kardon or a Bowers & Wilkins system. Both have amazing acoustics. You will have either 10 or 13 speakers around the sedan, giving you the sound you want for music, podcasts, and more.